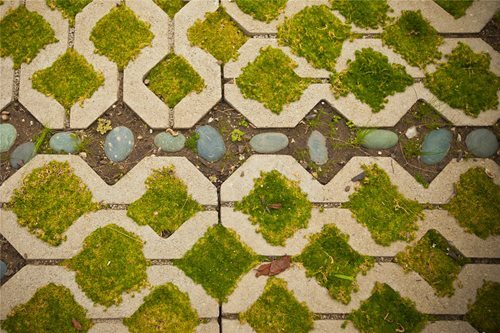 Traditional materials can be used to create beautiful permeable surfaces. Learn how pervious paving materials allow rainwater and irrigation water to penetrate into the soil and reduce runoff. An excellent option for homeowners concerned with sustainability and water conservation, permeable paving allows water to pass through small openings and re-enter the ground water. 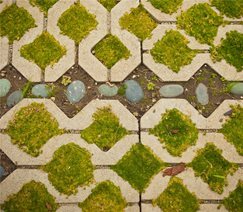 There are a variety of permeable materials that offer the best of both worlds: a porous patio or driveway surface that is also very attractive. Permeable paving is not a new concept - hundreds, possibly even thousands of years ago, people were making roads and paths by setting stones in sand. Many of these ancient creations have survived to present day, proving that permeable pavements are strong and durable. However, during the 20th Century's rapid development impervious pavements became the norm. With the recent push towards sustainability and the concern over the water supply eco-minded people have begun to challenge this norm. Many homeowners are looking to create sustainable landscapes and permeable paving helps achieve that goal. In fact as an incentive, many cities, especially in the Western states, are offerring sustainable landscaping rebates. As we hear about water shortages and increased levels of pollution, the benefits of installing a patio, path or driveway that allows rainwater to filter through to the earth below are very appealing.